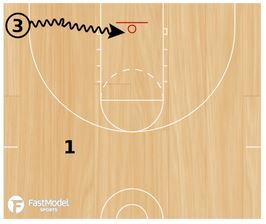 This finishing drill was posted in the FastModel Sports Basketball Plays and Drills Library. 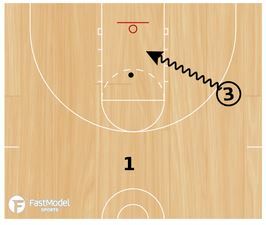 The drill was posted Marc Skelton, Head Boys Basketball Coach at Fannie Lou Hamer Freedom High School in the Bronx, NY. 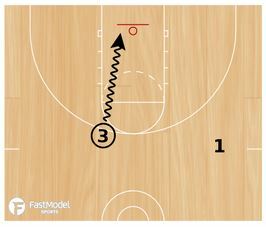 This continuous game-like finishing drill works on 5 different moves from 5 different spots on the floor. These moves can be attempted at different spots using left or right hands. 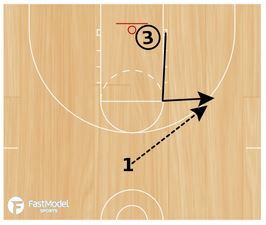 This drill also helps develop footwork (pivots), rip through, and ball fakes. We name the moves after NBA players as it is easier to remember and embrace. 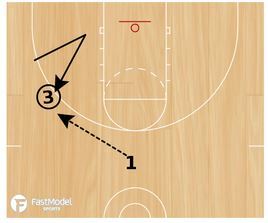 Bonus:1) Add Euro step 2) Add a blocking pad to finish with contact. 1) Wing executes a V-cut, catches the pass from coach (1 in diagram), and executes a double rip though. 1) Attack with right hand into shaded area and performs an up and under move- finishing with the left hand. Alternative move- rip though, attack with left hand and finish with right hand on left side. Starts as soon as the ball goes in from the first move. Drive with left hand and plants right foot around the dot for a step back jump shot. 1) Wing sprints to the corner. 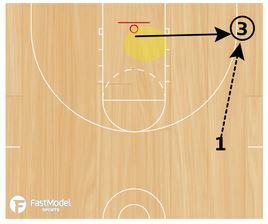 Drives left and performs a “half-moon” move coming back to the middle of the floor, then finishes at the rim. 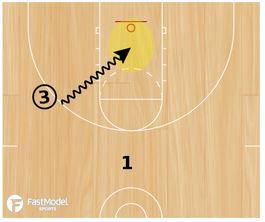 4th move starts as soon as the ball goes in from the 3rd move. 1) Wing back peddles to the corner. catches the pass from the coach, makes a ball fake back to the coach-essential to practice ball fakes. Drives left and performs a spin move when he gets into the shaded area. 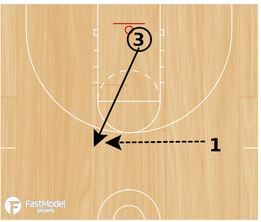 Starts as soon as the ball goes through the basket for move 4. 1) Wing sprints to the slot. Catch and face and rip to a left hand move.